The trip to Chicago was an excellent quick jaunt full of art, fellowship, and Mr. Ferry in a rare casual moment as the catalyst. After flying into Chicago [special thanks to Soft Cell and… Led Zeppelin for making this possible], I took in an eyeful of art at the city’s Cultural Center, The Art Institute of Chicago, and not forgetting Millennium Park, where “Cloud Gate” was, for every gram, even more impressive in person than the photos imply. The modern art in the collection of the Art Institute was particularly impressive to my eyes. Their collection was rife with groundbreaking work of my favorite modern period. Surely, the visual equivalent of Post-Punk. Sooner or later, however, the Monastic focus much come back to music. This evening was somewhat different. 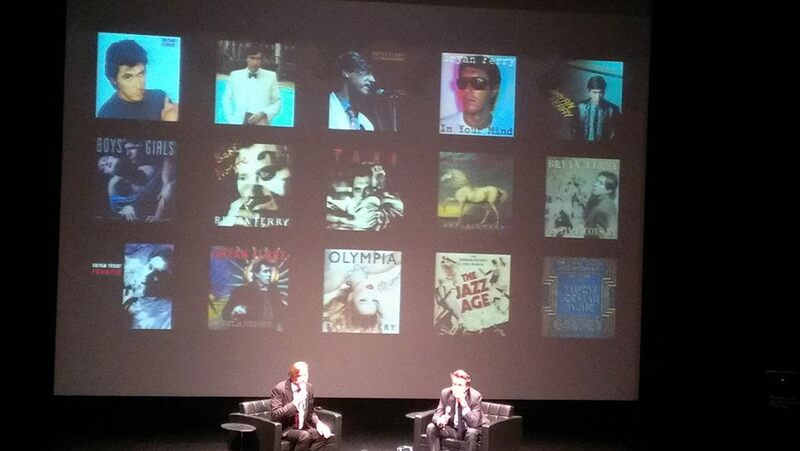 It was words on music with Bryan Ferry onstage having a career panel with author Michael Bracewell moderating. I imagined that it would be like the Moogfest panels I saw on Nile Rogers and Giorgio Moroder, with the difference that Ferry looms far larger in my personal sphere. I met my friend JT after his working day was done and we proceeded to the Museum Of Contemporary Art [who are hosting the US showing of ‘David Bowie Is’ starting yesterday] to await seating. His friend Lara was meeting us and my friend Cathy was also attending. We eventually linked up and got our seats in the black box theatre which seated 250. It was exactly like the Moogfest panels. Bracewell came onstage first and set up the talk briefly, followed by playing the iconic “Remake/Remodel” video from 1972 by way of setting up the impact that Roxy Music immediately had. Then Mr. Ferry arrived, looking relaxed and loose. Having seen him reticent and somewhat introverted in interviews, his friendship with Bracewell was a double edged sword that made him both at ease and relaxed, even while swinging at the softballs that Bracewell invariably pitched. The first half of the talk was the most interesting portion, as it covered Ferry from birth to University, complete with photos. Hearing him talk about his relationship with music, that got such a hold on my by the age of ten, I couldn’t help but be reminded of both myself, and most of my friends. We all heard that siren’s call at an early age, except that I can’t say that I was a fan of Charlie Parker at such a precocious stage! But it was not just jazz, but the nascent emergence of rock and roll that also informed Ferry’s development. He told of winning tickets from Radio Luxembourg to see Bill Haley + The Comets in 1955, at the age of ten! He attended the show with his big sister and one can only imagine the impact of such a pivotal act at such an early age. His college years were also discussed, and I was surprised to find that The Gas Board was not the first band he had sang with. Apparently, he and Graham Simpson were part of an earlier, less stage combo that saw Ferry singing in Northern working men’s pubs! The experience of having Richard Hamilton as a professor was also a profound influence. That concurrent with Ferry’s matriculation, Hamilton was immersed in making the reconstruction of Marcel Duchamp’s seminal “The Bride Stripped Bare, by her Bachelors, Even” must have been a heady experience for the young Ferry. At the talk’s midpoint, the story moved to the formation of Roxy Music, and from that point, the pace quickened substantially; covering territory that must be terribly familiar to anyone reading these words… correct? Once his mature career became the focus, the rest of the time was an invocation of album cover shoots, and the many many musicians whom Ferry has relied upon to realize his vision. One tidbit that I was unaware of was the Ferry said that he had just wrapped up his latest solo album a week or so prior. The title was “Avonmore” and it would again have musicians Flea, Nile Rogers and Marcus Miller onboard. At the time I thought this was a small bombshell, but by the time I had returned home, it was only days later when the Ferry PR wheels had already begun turning for this latest opus. It’s an interesting take on the Palmer classic that adds further delicacy and nuance to the already tender number. I’m assuming that like “You Can Dance” and “Shameless” [which previously appeared as collaborations with DJ Hell and Groove Armada in advance of “Olympia’s” release] the version of “Johnny + Mary” here may differ. 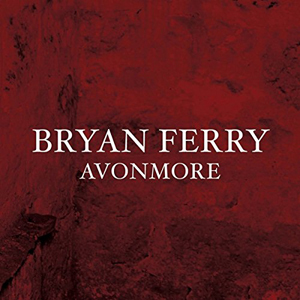 We’ll all be able to find out on November 17 when “Avonmore” is released on CD/DL/LP, all the same program at reasonable prices. I’m relieved that the now-mandatory “enhanced” release with similarly enhanced price has been left aside this time. Ferry will be 69 on Friday and instead of slowing down, he seems to be speeding up. The last five years have seen four albums [Olympia, The Jazz Age, The Great Gatsby OST, Avonmore] in addition to numerous one-off collaborations with other artists and collectives. In contrast to the glacial pace of his work in the 80s and 90s, which saw only seven albums in that 20 year period, he seems like he’s gotten re-energized in the last decade or so. He tours extensively and his agreement to sit down on a small stage in Chicago and discuss his career would have never been anticipated in previous years. This entry was posted in Core Collection, Organ Auction Live Event and tagged Bryan Ferry, Chicago, panel. Bookmark the permalink. As much as I like this version of Johnny & Mary, I’d be depressed if this is representative of Ferry’s vocal sound now. I saw the concert he did at Coachella and his vocal were pretty ragged, but somewhat stronger than this. There he had a small army of backup vocalists to help out, so it wasn’t that much of a deal. We’ll have to wait and see, I guess. I can hear the difference in Bowie’s voice too, but it hasn’t degraded nearly as much. I feel as though Todd Terje layed a heavy hand over this particular version of Johnny + Mary. The entire Terje album has a quite “thick” production sound which doesn’t do some of the more subtle or electronic tracks any favor – including the Ferry number. I had to EQ each track in iTunes – no enjoyable exercise at any time. Have to say I am looking forward to some new work from BF. I’ve heard the opening track and it has a VERY Bette Noir feel to it. I’ll be front and center at The Beacon Theatre next Wednesday to see just how the great man is live for the first time in over a decade. Echorich – We await your report! I have not seen Ferry [sing, at least] since two dates on the Roxy Reformation tour in 2001.
chasinvictoria – Where have you been?! Years of smoking have taken their roll on Ferry’s voice for years! We first noticed evidence of this with his 1999 album of jazz standards, “As Time Goes By.” My wife immediately noticed the change in his voice. He’s lost much of his power since then, but that’s not necessarily a bad thing as his age advances. He sounds more vulnerable now and if he uses it to his emotional advantage as on the Palmer number, I don’t have a problem with it. He will be 69 years old tomorrow. Face facts, True Believer. He’s getting up in age for a singer, but we can all look to the example being set by Mr. Cohen, hopefully. As for Bowie, he could always smoke Ferry on vocals. Bowie is a belter. Ferry was always a more idiosyncratic singer, with much more of an r+b influence than Bowie had, “Young Americans,” notwithstanding.